Although numerous studies have cited the benefits of breastfeeding a baby, this isn’t always possible. The next best thing is to provide your baby with a nourishing formula free of any potentially harmful chemical ingredients, but with the multitude of options out there, how do you find the best organic baby formula? We gathered the highest rated organic baby formula products, analyzed their ingredients and their effects, and went through customer reviews to make sure we provide all the info you need to pick one! The HiPP organic formula is suitable for newborns and is designed to build infants’ strength and immune system throughout their first few months of life. This whey-based infant formula contains a nutritionally complete combination of nutrients to support growth like essential omega-3 and omega-6 fatty acids, and babies will also benefit from a proprietary blend of probiotics that strengthen a baby’s immune system. The manufacturer’s goal is to offer the best organic baby formula backed by 50 years of research into the benefits of breast milk. It’s designed to be gentle on the stomach while providing essential nutrients, vitamins, and minerals. The manufacturer is also innovative in the design of the formula packaging as the milk storage box is reusable and comes with a scoop holder and leveler to make preparation more convenient. This dry powder should be stored in a cool, dry place but not refrigerated. This is the best organic baby formula for infants who suffer from acid reflux. The milk has a pleasant taste, so it might be the best formula for breastfed babies being weaned. HiPP is a UK-based company, so you may have to pay extra for shipping when ordering from an international seller. The formula contains milk, soy, lactose, fish oils, and vegetable oils, which may pose an allergen risk for your baby. Most organic infant formulas are made with lactose, which is an easily accessible carbohydrate for energy, but not all babies can readily take lactose. So Similac Sensitive Baby Formula is designed for infants who need a gentler formula on their stomachs. Appropriate for babies aged newborn to 1 year, this formula can help ease fussiness and gas caused by sensitivity to lactose. 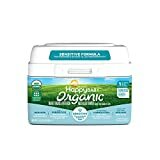 This is the best organic baby formula for vitamin absorption, designed with a unique blend of carbohydrates and other nutrients. The special OptiGRO formula contains a blend of essential nutrients for your baby, including DHA and lutein for brain and eye development as well as vitamin E. Similac Sensitivereviews are positive. This formula holds the distinction of being the top brand chosen by moms and hospitals in the United States. The milk-based organic infant formula contains probiotics that are found in breast milk, promising to keep your baby healthy and well fed. This formula does not contain palm oil. It can be made ahead of time and kept in the refrigerator for up to 24 hours. This formula should not be given to babies with galactosemia. Some ingredients may contain GMOs. One of the ingredients is high fructose corn syrup. 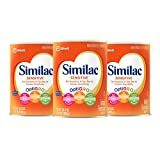 The Similac company is famous for its high-quality products and another one of their baby formulas is featured on our list of the best baby formula of the year. If organic is not one of the criteria you are keen on, check it out! This organic baby formula was developed to resemble breast milk when it comes to its taste and ingredients. It comes in a 21-ounce tub which yields about 150 fluid ounces of formula and provides complete nutrition for the first 12 months of a baby’s life. The formula contains prebiotics, vitamins, minerals, zinc, folic acid, and organic lactose. It also contains DHA and ARA, which are the most abundant Omega-3 and -6 fatty acids and contribute to the development of the nervous system and eyesight. These are extracted from non-GMO algae so you can be sure it comes from reliable sources. Does not contain corn syrup solids or other synthetic sweeteners. Does not produce gas and is the best organic baby formula for babies prone to colic. Can cause allergic reactions in sensitive babies. Does not have a very appealing smell and some babies reject it. Made especially for a baby’s first 12 months of life, Earth’sBest Organic Formula is a milk-based powder formula. It contains iron along with a host of other minerals to help infants’developing bones. The manufacturer wants the product to be as beneficial for a baby as breast milk, so probiotics are added to strengthen the immune system. DHA and ARA, two essential fatty acids found in breast milk, are added to boost a baby’s brain and eye development. This organic formula is made without corn syrup solids, growth hormones or any artificial colors, preservatives, antibiotics or steroids. 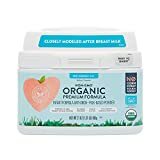 If you want to provide your baby with a natural, USDA-certified organic formula, then Earth’s Best is easy for babies to digest, and is also simple to prepare (just add water). If your baby is sensitive to lactose, Earth’s Best OrganicSensitivity Infant Formula provides all the same health benefits but with a reduced lactose content to alleviate gas and upset stomach. This option is one of the best organic baby formulas for sensitive stomachs. The formula has a shelf life of about three years. The taste is very close to breast milk, which may make it the best organic formula for breastfed babies who need to switch to the formula on a temporary or permanent basis. When prepared, the formula can have a foamy film. This formula has sweetener as one of the ingredients. Honest Company formula is made with USDA-certified organic and non-GMO ingredients. Manufactured to be as close to breast milk as possible, the formula contains folic acid, iron, calcium, vitamin D, and probiotics to support the immune system. Unlike other formula powders, this HonestCompany formula does not add DHA or ARA. However, it is free of gluten, corn syrup solids, sucrose, and carrageenan. This cow’s milk-based product is made with a minimum of 95 percent organic components including a balance of carbohydrates, fats, proteins, vitamins, and minerals for optimum growth. According to the manufacturer, it’s easy for babies to digest and requires only water to prepare. The formula is smooth rather than gritty. Very easy to mix and prepare. Contains palm oil to help with absorption, which is a blend of many oils with unknown effects on your baby. It may cause constipation due to the lactose. Ready to Prepare that Formula Now? When you want to select the best organic baby formula for your infant, take a close look at the ingredients. You want your organic infant formula to be as close as possible to breast milk to provide all the essential nutrients for growth and immune system development. Do you have any recommendations for the best organic baby formula?